This story is making the rounds today. And why wouldn’t it? 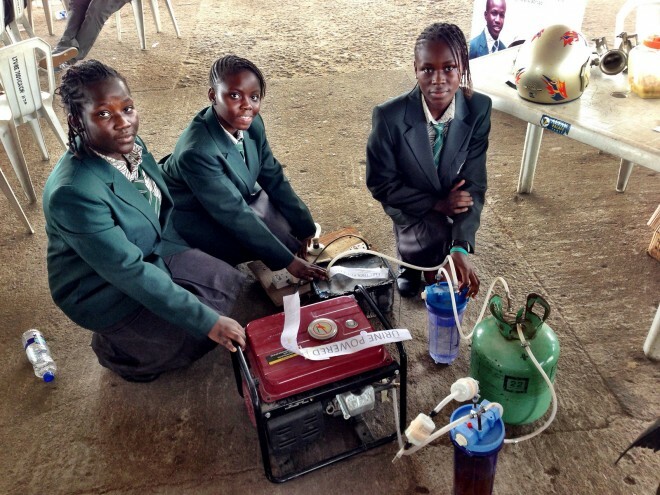 Four African teenage girls bring a contraption to a Maker Faire that purports to create hydrogen and then electricity from human urine. How cool is that?! After the initial buzz wears off, the questions begin to creep in. Really? Can you really do that? Wouldn’t it take more electricity to split out the hydrogen than the generator could produce? I haven’t seen a complete analysis of the project, just many repetitions of the original story. So the jury is still out on whether this device has a future or not. But you have to remember that this was a project at a Maker Faire, in Africa. There are at least two inspiring parts to it. One is the possibility of putting a daily renewable resource, that we consider waste, to use. The other is that the project was done by 4 African teenage girls, which is a triple inspiration all in itself. The combination of these two parts makes the story almost irresistible. And there is science behind the project. In 2009 scientists at Cambridge University published a paper titled “Urea electrolysis: direct hydrogen production from urine.” It lays out the simple, inexpensive process of getting hydrogen from urine using electrolysis with nickel plates. Their study shows that it takes 30% less energy to get hydrogen from urine than it does to get hydrogen from water. One of the main objections to the feasibility of a urine powered generator comes from using the hydrogen to replace gasoline in the generator. What would happen if they rather put it into a fuel cell battery? Who knows? The story rates a place on this page because of the great idea – use urine to generate electricity, and the practical steps – four girls built a contraption and took it to the faire. If it goes any further the updates will wind up here, too! Thanks! Glad you found it interesting.